Shamelessly copying and pasting from their MySpace site here's the background on another band to watch out for in 2010. 'City Light was started by Seattle singer songwriter Matt Shaw with long time friend and bay area producer Nick Andre, who's releases have featured Gift Of Gab, Lateef, Lyrics Born and more. As the project progressed they called upon musician and producer Denver Dalley from Desaparecidos, Statistics, and Intramural and Seattle singer songwriter Andy Fitts from Airport Cathedral and Aqueduct. Together the four of them worked to create one record from three corners of the country that mixed genres of indie-pop, rock , and hip hop. The end result is a dark and unique pop record full of catchy tunes, experimental electronica, and driving beats'. The album 'Burned Out Bright' is due for release on the 26th January 2010, and having just listened through, this one is going on my personal play again list. You can also here more over on their MySpace site. More album release details in due course. 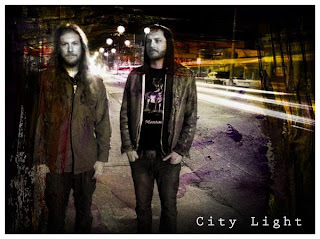 Their PR adds 'Blending gritty, earnest vocals (ala Bright Eyes) with sunnier, subdued melodies and driving beats, City Light has struck the perfect balance between tradition and innovation. BURNED OUT BRIGHT is sure to please City Light’s existing fan-base, and will undoubtedly bring the group much deserved attention over the next year'.